What do we prize most? Are integrity and ambition mutually exclusive, as we seek a place in the world? How do we value, ultimately, a piece of art — or a life? These are the questions at the core of the evocative new novel by New York Times bestselling author Jill Bialosky. Talented, successful, blessed with a loving wife and daughter, Edward Darby has everything a man should hope for. With a rising career as a partner at an esteemed gallery he strives not to let ambition, money, power, and his dark past corrode the sanctuary of his domestic and private life. Influenced by his father, a brilliant Romantics scholar, Edward has always been more of a purist than an opportunist. But when a celebrated artist controlled by her insecurities betrays him, and another very different artist awakens his heart and stirs up secrets from his past, Edward will find himself unmoored from his marriage, his work, and the memory of his beloved father. And when the finalists of an important prize are announced, and the desperate artists maneuver to seek its validation, Edward soon learns that betrayal comes in many forms, and that he may be hurtling toward an act that challenges his own notions about what comprises a life worth living. A compelling odyssey of a man unhinged by his ideals, The Prize is as well an unflinching portrait of a marriage struggling against the corroding tide of time and the proximity to the treacherous fault line between art and money. 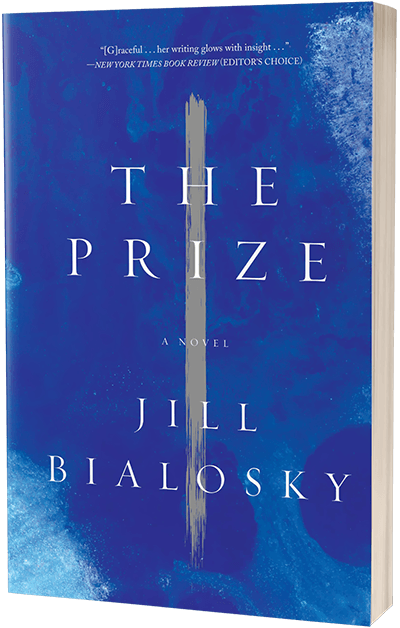 Inspired by her work as a poet and the need to preserve a private space for the creation of art, The Prize by Jill Bialosky is her most moving novel yet.